Please join the Vision Forum Opera, OuUnPonian Jacopo Miliani and many more at David Roberts Arts Foundation London, Saturday January 19, 2013. Michael Newman will present The Impossible Relation: Bellmer, Sade, Blanchot, a lecture in which he will engage with the movement from I to It and the disappearance of the object. Michael Newman is an art historian and critic whose writing is concerned with the image and its fascination. He teaches in the Department of Art History, Theory, and Criticism at the School of the Art Institute of Chicago, and is Professor of Art Writing at Goldsmiths College in the University of London. 2 / FROM 4 TO 6 PM: ACT III – AN OPERA IN FIVE ACTS: Choreography Conceptualised by Manuela Ribadeneira and Fatos Ustek, realised with Annalisa Sonzogni, Joel Vacheron, Ariella Yedgar, ACT III invites you to take part as performers both on stage, in the orchestra and in the audience. 'There is very often a moment in which the art world meets another world, the world of Palaeontology perhaps or the world of International Trade.' (Simon Starling) How does knowledge become a practice? With Aurélien Froment, Jacopo Miliani and Simon Starling. 6.30pm. A one off screening of one of the most elaborate project to date by British artist Simon Starling: Project for a Masquerade (2010-2011). The film documents a Japanese mask-maker carving a set of six traditional Noh masks. A voiceover unravels an hypnotic narrative referring the atomic bomb, Henry Moore, James Bond, etc. 7.15pm. If You Can Dance...You Will Be My Memory (2013) by Jacopo Miliani is a new project that the Italian artist conceived exclusively for Fig.5 in collaboration with The Place, the London based premier centre for contemporary dance. Between October 2012 and January 2013, the artist led a series of workshops with six professional dancers investigating the idea of memory, not only as a visual or narrative stance, but also, as corporal and emotional one. The performance and installation at DRAF will be an investigation on how movements can translate a total experience of an artwork. During the day, two videos by Aurélien Froment will be shown. 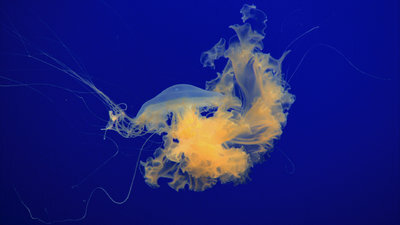 Pulmo Marina (2010) is a single 5-minute long shot of a changing form jellyfish, seen through the window of an aquarium. Pulmo Marina introduces the shift from the collective experience of the museum towards the private experience of the screen/projection. How to tie things together? Rabbit (2009) borrows the format of instructional films for aspiring sailors. DRAF wishes to thank The Place and Chris Thomson for the precious help and assistance.